Barcelona is a cool city with interesting architecture and great food, and the Fira Gran Via exhibit complex is an amazing venue for a 90,000-person A/V, building-controls and home-automation show that has outgrown Amsterdam RAI. 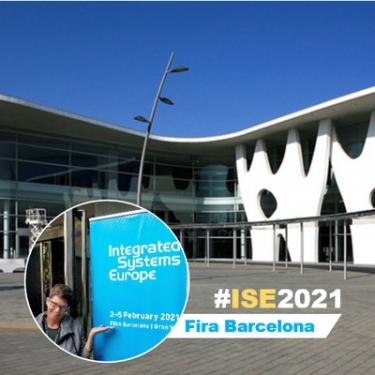 Integrated Systems Europe (ISE) 2021 will move to Barcelona after 14 years in Amsterdam. The big A/V, building-controls and home-automation show, produced by industry trade associations CEDIA and AVIXA (formerly Infocomm), simply outgrew the Dutch city’s RAI exhibition center … about two or three years ago. Last year, RAI had to tack on a temporary pavilion (don’t call it a “tent”) to accommodate the ever-growing mass of exhibitors and attendees – nearly 81,000 of them in 2018, and expected to grow 10 percent per year. 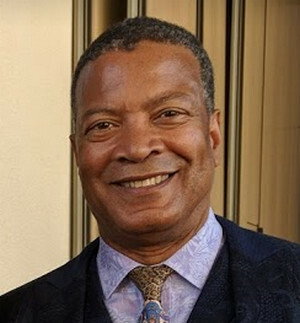 In 2019, ISE will consume “every corner of the RAI,” said Mike Blackman, managing director, Integrated Systems events, during a press event last week to introduce the new venue to journalists and industry advisors. 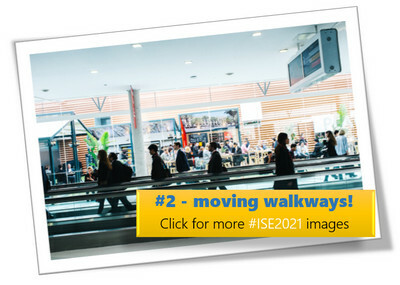 Already, ISE faces waiting lists for new exhibitors and can’t accommodate existing vendors that want more space. Meeting rooms and private entertainment areas are maxed out as well. You know how when you buy a house for just the two of you, and it’s really comfortable? But then you have children that fill up the spare rooms, so you have to convert the attic and then the basement, and then it’s no longer comfortable? That’s ISE, Blackman said, in so many words. Fira Gran Via Barcelona is a huge exhibition center, with eight halls and about 200,000 square meters of exhibit space, compared to 87,000 square meters at the RAI. It’s home to the big tech show Mobile World Congress, which draws more than 100,000 attendees every year and still has room to grow. Despite its gargantuan size – in fact, because of it – the Gran Via is incredibly simple to navigate. Imagine this: Halls neatly arrange in chronological order and one giant walkway above it all. Annoying slow-walkers … be gone! One huge benefit of all the space is the opportunity to cluster exhibitors in similar product categories – a particularly useful concept for residential-oriented vendors. With no wiggle room at the RAI, you had Control4 in one hall, far removed from Z-Wave and KNX, and yet farther away from the appointed “residential” hall ... all overwhelmed by huge digital-signage stands, unified communications exhibits and pro-audio booths. Starting from scratch in a giant new venue allows ISE to “focus the show a little more,” Blackman says. Attendees don’t necessarily have the luxury of spending four days on the show floor, so they will be able to spend their time in the areas that matter most to them, rather than hall-hopping to hit their personal highlights. As for CEDIA, the mostly-residential arm of ISE, the organization couldn’t be happier. Fira will accommodate a larger booth for the association, which has been split into two rather awkward spaces at the RAI. Europe has become a far more important region to CEDIA over the past couple of years as the group has morphed into a single international entity, rather than an American association with fairly autonomous offshoots around the globe. O’Connor joined a panel of luminaries during the Barcelona press event at the historic city hall, including her counterpart at AVIXA, David Labuskes. Barcelona Mayor Ada Colau welcomed the group to a city “committed to talent and innovation.” Angels Cacon, the Catalan Government’s Minister of Enterprise and Knowledge, touted the region’s “technological leadership,” and Fira general manager Constanti Serrallonga said he has patiently waited years for this moment.